Laguna Niguel Orthodontist Answers: Can Braces Fix Gaps in Teeth? Gapping between the teeth is an orthodontic concern that many people seek treatment for. Closing your gap may even be the only reason you need braces. 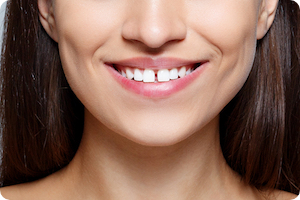 Known formally as diastema, gaps in teeth can cause self-consciousness and also dental issues. Many patients with this issue often ask, “Can braces fix gaps in teeth?” Laguna Niguel orthodontist, Dr. Kimball, answers this question below. Can Braces Fix Gaps in Teeth? Your preferred option should be able to close your gap effectively and give you the smile you have always wanted! Talk to your orthodontist about your specific desired treatment. Sometimes, the causes of gaps are hereditary and simply formed by the structure of your mouth. They can also be caused by certain inherited disorders that affect the jaw and teeth eruption. However, specific causes have also been identified, such as thumb sucking, missing teeth, teeth that are crowded, and different-sized teeth. Paying close attention to these issues and getting treatment quickly will provide the best outcome when trying to close a gap. Are There Risks with Gaps? There are actual dental risks associated with gaps. While most people focus on the aesthetics of having gapped teeth, gaps can also damage their gums. With a gap, you have an exposed section of gum that can be damaged simply by biting too hard or getting food stuck in between the teeth. It’s best for your gum health to close the gap and protect your gums. Contact Laguna Niguel orthodontist, Dr. Kimball, to learn more today! *The information provided in this article is not meant to be medical advice and is for educational purposes only.